I think I listed all of those in my last post, but if you have any more then please add them. Today I noted 1G29 (12:15 PAD-CNM) and return 1L67 (15:00 CNM-PAD) were shortformed to 5, but the 12:22 PAD-MIM and its later working were longformed from five to nine cars. An opportunity for a set swap missed? Also not listed on Journeycheck. I didn’t spot any others today. I've noticed that Journeycheck has not been up to full speed of late. At times, it has told a very different story to the cancellations map, which on further inspection seems to be more accurate. A few months before ATW finished, they removed the whole Formation section from Journey Check due, it was said, to a lack of resources to manage the provision of the information. TFW have not revived it. A couple of those would have been absolutely fine as a 5-car, but a couple would have been very busy - 1L70 was reported full and standing, and I would expect it would have been very snug on 1L66 and 1C25. Still, that means a total for the week of around 20. It's possible I missed few, but I looked pretty closely at JourneyCheck and the set allocations on our internal systems so don't think I did. So at a rough guess there's about 1000 80x workings a week, giving a total shortform percentage of around 2%. We'll see what happens next week if I have the time to check. Yesterday saw one of the diagrams covered by a HST (listed on JourneyCheck) and another 9-car 800/3 one covered by a 5-car 802/0 (not listed on JourneyCheck). One of the better diagrams to substitute as 1D37 and 1P45 can easily cope as a 5-car, and most of the journeys of 1W01 and 1P39 can as well - though no doubt there will have been people forced to stand at certain points. 1C89, 16:33 PAD-EXD was a 5-car today I think. 1J93, 18:07 PAD-FRO definitely was, and 1G60 17:42 PAD-CNM would have been but for some reason it never left Paddington so was cancelled. So, three short forms today including the one this morning. 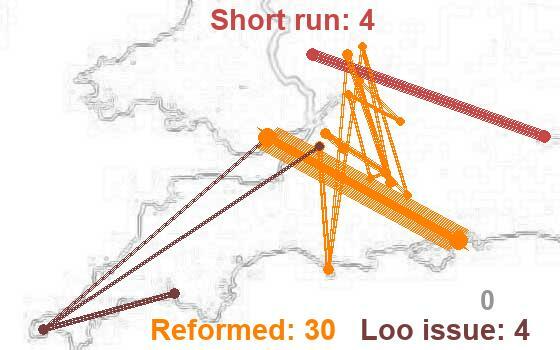 All on the same diagram which was restored to a 10-car for the next working, 1C24, 17:30 Paddington to Taunton. Think that's the lot for today in case anyone spotted any others? It’s good to see short form IET workings have become few and far between. It gives you more confidence that when you turn up at the station your train should be the booked number of carriages. Yes, it's still far from perfect, Broadgage's sensible benchmark figure of 0.5% is hopefully where we'll be eventually, but it is certainly way less than the dozen or so a day we saw most days for much of last year. Also by keeping this log for a few weeks it gives some actual data rather than just anecdotal observations by which you could easily get the impression that it's worse than it actually is. My suggested figure of 0.5% of trains being short formed is far from impressive for a new and hugely costly fleet, and should in my view be regarded as a barely acceptable maximum, and not as the "new normal"
In the last few days I have observed several short formations of 8 car instead of 9 or 10, presumably representing an HST instead of an IET. This is not a huge problem in itself but it does rather beg the question as to what happens when GWR no longer have HSTs available. it does rather beg the question as to what happens when GWR no longer have HSTs available. Posts in various places suggest there are currently 9x 9-car IET's (802/1's) still to be delivered, running from next week until mid-April. 800001 & 800002 (which I think are 5-car units) are also allocated to driver training and not in passenger service yet. The fleet is pretty interchangeable at the moment, there have been occasions where a HST has been replaced by a 9 or 10-car IET. I haven't bothered listing any HST replacements in the same way I wouldn't list any 9-car vice 10-car IET formations as the difference in seating is negligible. I guess your question will be answered in a couple of months when the HSTs have all gone, by which time of course the 14-strong 802/1 fleet should have been largely accepted - I think there's still more of them to turn a wheel in passenger service than HSTs that still need replacing. I think it's about right, and as mentioned earlier would equate to ten trains per week in the new timetable - when there will be some more workings booked to be covered by 5-car trains due to the increased frequencies. Even better if there is a corresponding slight reduction in cancellations when the scenario arises where a train failure means a 10-car unit can be split into two 5-car ones to avoid a cancellation. With the HST fleet it was very unlikely you'd be able to pluck a set out of thin air if one failed, unless a good old Turbo could come to the rescue!